Asbestos is a naturally occurring mineral, very strong and heat resistant, which was made into nearly three thousand products ranging from pipe insulation to cement wallboard. Asbestos has been proven to cause lung cancer, mesothelioma, and asbestosis, and needs to be treated with respect and handled by professionals under controlled conditions. Currently no state or federal laws require removal or repair of ACM except in schools, but it is most important to maintain asbestos-containing materials (ACM) in good condition to prevent serious health problems that result from breathing asbestos fibers. Some materials in good condition, like flooring and siding, can be left alone until they will be impacted by renovation or demolition activities or they can be covered over. Be careful to document the locations of covered ACM, because real estate laws require disclosure of all ACM at the time of sale. 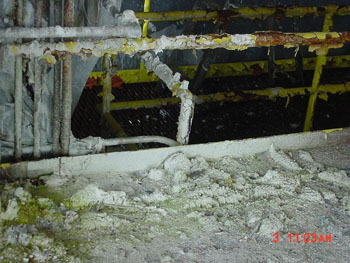 Once a decision has been made to impact asbestos-containing materials (ACM), such as pipe insulation, boiler breeching, vinyl asbestos tile, transite (cement board), siding or roofing, in amounts greater than 3 linear or square feet, it must be removed or repaired by professionals unless specifically exempted from the DEP regulations. For example, floor tile in good condition may be removed by a non-licensed company using an infrared tile lift machine or a heat gun provided the tiles come up whole, and owner occupied single-family homeowners can remove their own asbestos siding following DEP guidelines. To see photos of asbestos, please visit our photo gallery. Transportation and disposal of ACM waste are regulated by the DEP as well. Once a job is complete, the waste must be transported by a DEP-licensed "non-hazardous waste transporter" to a landfill approved to accept friable asbestos. Intact non-friable asbestos waste, like roofing, cement pipe, siding, and flooring, which is removed whole can be disposed of at local landfills in accordance with the landfill's license requirements. American Academy of Pediatrics – Information on keeping you child safe from asbestos. National Institutes of Health - More information on the health effects of asbestos.